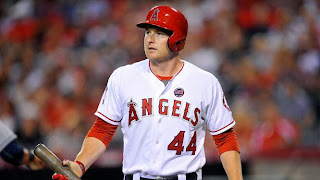 Tru School Sports: What Should We Expect To See From Mark Trumbo in 2014? What Should We Expect To See From Mark Trumbo in 2014? Earlier this week, as most of you have heard all ready, Mark Trumbo was traded to the Arizona DBacks. The feeling going into the Winter Meetings was that the Angels were going to shop Trumbo in an effort to bring in a starting pitcher. They did just that by acquiring Hector Santiago and Tyler Skaggs. Trumbo intrigued a lot of teams due to his raw power. Over the past three years, Trumbo hit 95 home runs for the Angels. Los Angeles, who have Mike Trout, Josh Hamilton and Albert Pujols, could afford to give up a power bat if it meant getting a young starting pitcher in return. Trumbo was the only option out of those four that they could move. So why didn't more teams jump on the opportunity to acquire a young 24-year-old stud who is under team control until 2017? Somebody coming off a 34 homer, 100 RBI season? Well in 620 at bats, he hit just .235. Arizona decided that Trumbo was worth the risk. They gambled on Trumbo and I believe it will work out well. Trumbo has shown extreme power in his young career, and now that he's playing at Chase Field where the ball just seems to fly all over the place, he has a chance to hit 40-plus homers in 2014. I expect Trumbo to bat behind Paul Goldschmidt in the Arizona lineup and give Goldy some protection. Goldschmidt, who had a .401 on-base percentage last year, should be able to repeat his 2013 numbers and get on base for Trumbo so he could boost his RBI totals. Trumbo should be able to thrive in the National League and Paul Goldschmidt and Mark Trumbo could be one of the scariest power hitting combos in all of the majors. With Trumbo's high home run totals in the past, I will be shocked if Trumbo hits anything less then 35 homers in 2014.